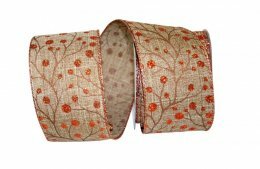 Use this Linen Ribbon accented with Metallic Copper Berries to combine a touch of relaxed style & everyday elegance the festive season! This ribbon to ideal to create a eye-catching wreath that brings together all the vibrant colors of the season! The Ribbon Diva offers a large collection of Fall Ribbon ideal for wreath decorating & creating one of a kind crafts!